Home / Music Theory for the Bass Player / Converting to fretless? How difficult is it to convert from fretted to fretless bass playing? While I don’t recommend to convert fully – both fretless and fretted have their uses – read in my article below what I recommend to keep in mind. 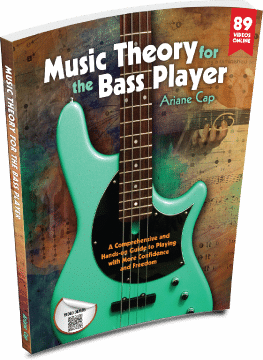 The transition is so much easier if you have a solid one-finger-per-fret regimen under your fingers on the fretted bass. And intonation of course is the biggest challenge – check some tips for that in the article. And experiment with all the options the fretless gives you and the fretted doesn’t – shaping the tones, vibrato, slides, pinch harmonic slides – a whole world of sound that the fretless offers. My first fretless was an Alembic Elan. It was fretted, really, but when I got my first Marleaux I had a hard time parting with that Alembic, so I had the frets removed – basically as an excuse to keep it. It was a neck through bass, so it sounded really beautiful. What is nice about removing frets from a fretted instrument you know well, is that you already know the ins and outs of that instrument. I had the fret groves filled with a dark brown wood dust – against the black fretboard I could see the lines up close. The dots were where I was used to them being (between the “frets”, so I had no problem adjusting Many fretless basses that have no lines have dots exactly where the fret would be, so it takes a bit of getting used to. And by the way, the bass in the picture above is a Fibenare bass. I am very lucky when it comes to amazing luthiers having built incredible instruments for me. But it is easy to get hung up on brands. While a great instrument is certainly an amazing thing, a lot of it is in the fingers. If you cannot see the box below please click here to read the article. I bought an exact copy of my main fretted bass, removed the frets, and filled the grooves with white epoxy. Then I put my tuner in my signal chain on the floor at my feet. When I knew I was out I used the tuner to help me tell flat from sharp. One more thing. Turn down the highs and mids. Get the blues/reggae tone in tune with no slides and work the brighter tones and slides in later. That’s perfect, then all distances will be the same per default! You are handy. I had an Alembic Elan that I turned into a fretless. Had a nice growl. Sold it to a friend.